It’s been in the works for a long time, but I have the pleasure to announce the publication of my monograph. Why Aren’t They There? is a comprehensive study of political representation in a cross-national format. It examines the representation of women, ethnic groups, and policy positions in a cross-country comparison. 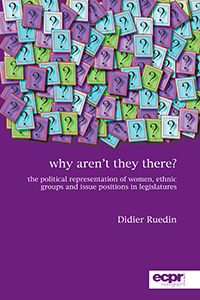 The book includes an analysis of the representation of women over time, and presents a critical view of the effectiveness of quotas. Using new data on ethnic groups in legislatures, the book is a significant step forward in the analysis of political representation. The representation of issue positions is examined in eight policy domains. The systematic approach of the book allows a ground-breaking examination of how different forms of representation – women, ethnic groups, issue positions – are interlinked. It examines aspects that are unattainable in studies focusing on only a single form of representation. This results in a comprehensive understanding of political representation, and leads to important and policy-relevant insights for electoral engineering.